Practically every grocery store and pharmacy around me now has a DVD rental kiosk. It’s funny to see them now because when I was a kid the 7-11 down the street from me had a VHS rental kiosk. I liked it and used it for the few months that it was there. I think it suffered from lack of storage space and so it could never make enough money to justify the floor space. The new DVD kiosks can hold many more movies but it seems like they arrived 10 years too late. More and more people will have a convenient way to rent movies from their cable/satellite box or over the internet and the DVD kiosks will also fade to a distant memory. 10 years too late sounds about right. I usually buy movies i like anyway, im not the kind of person who only watches a movie once, then never again. i usually rent/borrow movies. for some odd reason, i can never bring myself to watch the same movie again. i watch it it and if it isn’t confusing enough or weird enough to a point where i didn’t understand it, it goes back to the rental place. Pick-pocket havens these places would be. There are now ZERO movie rental shops in the town I live in, but there are three Redbox kiosks. I saw one get remotely rebooted, they use a Dell Optiplex GX270 PC running Windows XP Pro and TrendMicro antivirus. Just in case you wanted to know such things. We’ve still got a Blockbuster. We don’t go there anymore though, after they told us that if we wanted XBox 360 games, we had to use a credit card. We’ve been members for nearly ten years, returned our games in mint condition – and then they act like we’re not members and suddenly they NEED our credit information. WTF. 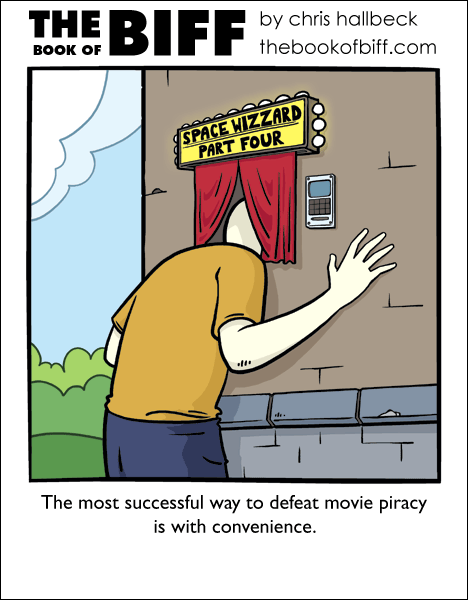 Space Wizzard? I would love a movie of Terry Pratchett’s Last Hero! I’d hate to see the SIZES of the popcorn. I’d hate to see how you got the popcorn. @Asq-Have you seen Hogfather? Very well done, I feel. I used to love renting movies from blockbusters but once I got Sky and Sky+ it was just so much more convient then driveing into town waiting in the shop driving home watching it then having to drive all the way back the next day. Yeah, I noticed those DVD rental kiosks. I pretty much ignored them since I first saw them. And I suppose Gamefly never asked for your credit card information? Your blockbuster card is out of date, let them update it and you’re good to go. I get most of my movies on-demand from cable, but I still love having the option of brick-and-mortar rentals. I really don’t like the kiosks. It seems like they’re just one more way to eliminate human interaction. Like we really need more of that. Now mind you, I’m biased, being a video clerk for the last six years. But, I’ve been watching all the brick and mortar stores fade away and it really kills me. Maybe I’m just out of touch, but I like being able to look around the video store and ask questions or get opinions on movies. But, it would appear I’m one of a dying breed. Two of the three Hollywood Video’s in my city folded last week. Just not enough interest, I guess. Best part of the brick-and-mortar shops is going to check out all the priceless gems that never make it to the big screen… or the small screen. I’d hate to see movie rental places disappear. The mood in those places is always so nice. I was going to play the giant slot machines and try and win a dvd but couldn’t figure out how to play. Thanks for saving me from an expensive misunderstanding. Blockbuster has some amazing prices on used games. Movies too. It’ll be a shame when video rental stores become a thing of the past. A tip for the RedBox. The promo code DVDONME will get you a free one night rental. It works one time for each credit or debit card you have. McDonalds (where many of the kiosks are located) periodically gives away free rentals with food purchases. I’ve yet to have to actually pay for a RedBox rental. 🙂 Still have some of the McDonalds freebies from the promo before the last one. Reminds me I need to use those most recent ones, they have expiration dates, the earlier ones don’t. Just try sneaking a camera in there!